I came across a quart of frozen tomato sauce in the freezer yesterday. (This shocks you, I know.) I had made the sauce (with sausage meat, said the masking tape label on its container) some time ago, and so it seemed a good idea to defrost the stuff and have at it. Next time I shall have to plan this meal in advance. I strongly urge you to do same. It's not as easy as it looks, okay. Trust me. I've had a lot of mediocre Sunday Gravy (that's tomato sauce to you civilians). Hell, I've made a lot of it myself. Not lately, though. It appears that I have gotten the Red Sauce thing down pretty well. It is not the sauce that my mother prepared each week of her adult life, no. But it is a good sauce. Worth sharing, I think. This is how I start most every Sunday Gravy these days: an onion, a couple celery stalks, two or even three small carrots, maybe four large garlic cloves, a little hot pepper, three or four anchovy fillets, and about half a dozen each of pork ribs and sweet Italian sausage. You have questions, yes? I thought so. Okay, about the anchovies. If I hadn't mentioned them you might never have known they were in there. To me the fillets are like using salt, except they also add a little depth to the flavor. I still use salt in my gravy, just not as much as I would if the anchovy wasn't in there. Just try it. It ain't gonna kill you. Next. This is not a spicy sauce, not at all; the amount of hot pepper provides only the slightest hint of heat, and so it is easy enough to not use if you choose. What else? Oh, the carrots. That's just my way of adding a little sweetness to the sauce. Many people add sugar, but I started using carrots some years back and like this way a lot better. Once things have sauteed awhile you add the ribs and the sausage and let them brown a bit. You're not cooking the meat here, just rendering some of the fat. As soon as you've accomplished this remove the meat and set it aside in a bowl or on a plate. After the meat is removed I add maybe a cup of red wine and allow it to reduce by at least half, if not more. I don't do this step all the time, but do think it adds a little complexity. Then it's time for the tomatoes. I use peeled whole Italian tomatoes (108 ounces here, as company was coming over), then break them up, first with a potato masher and then with my fingers. (Right inside the pot, yeah.) Turn up the heat to medium high and bring to a boil. Once the tomatoes start to boil, add the ribs and sausage, along with whatever juices have collected in the bowl, then lower the heat to a slow simmer. At this point I toss in three, maybe even four tablespoons of butter. I find that this mellows the sauce a bit, plus it adds richness. Then I add salt and pepper to taste and let things simmer (using a very low flame, so that you barely see a boil at all) for a couple hours. This is what was left of last Sunday's Gravy at Casa Polpette, after the imaginary couple from Illinois, The McTinderdonks of Holy Loch (don't ask), helped to lay waste to an enormous pot of the red stuff. I am happy that my guests enjoyed themselves so much, of course. But my own Monday night dinner did not, shall we say, quite go as I had imagined. I killed a whole mess of plants the other day. No, I do not feel good about it. "Crop thinning," it's called. Vegetable gardeners do it all the time, the good ones do anyway. They yank from the ground perfectly healthy seedlings so that other seedlings, a proper number for the space alloted, may prosper and grow. I must not be a very good vegetable gardener. For rarely, if ever, do I summon the courage to launch such a killing spree. I simply don't have the heart. And so, it is with trepidation (and an ample amount of shame) that I present to you this particular item: A very lovely pesto made with the fronds of scores of baby fennel seedlings that I ripped from their Mother Earth one dark day last week. It was a simple matter of substituting the fennel fronds for the basil; that's it. The recipe is the same pesto recipe that I have used for a couple decades now, courtesy of Marcella Hazan. It was delicious, yes, tasting remarkably like a basil pesto, just a bit milder, softer even. Sadly, I may find myself on another killing spree next year. Adapted from Marcella Hazan's "The Classic Italian Cookbook"
Put the basil (or fronds), olive oil, pine nuts (or walnuts), chopped garlic, and salt in the blender and mix at high speed. When evenly blended pour into a bowl, and beat in the two grated cheeses by hand. When the cheese has been evenly incorporated with the other ingredients, beat in the softened butter. Before spooning the pesto over pasta, add a tablespoon or so of the hot pasta water. When freezing pesto do so without adding the cheese and butter. Add the cheese and butter when it is thawed, just before serving. The sweetest pastry that I have ever had was a gift from a woman whose name I do not know, face I did not see, and kindness I cannot possibly repay. This pastry, a miniature cannoli, came to me in the most peculiar way and in the unlikeliest of settings. It was tossed into the limousine that I was riding in. On the way to my mother's burial. My brothers and I are not the limousine type, but we had sprung for two cars that morning so that the elders in the family, my mother's brothers and sister and their spouses, would not have to drive. Once the funeral service at the church was over and the aunts and uncles were safely inside their car, my brother Joe and I took our places in the other limo. I was on the driver's side, at the door. My brother Michael was in front of me, and so he was at a door as well. It all happened so fast. Just as the driver began to move away from the curb Michael's door swung open and I could see two hands and a white box thrust towards him. An instant later I saw the hands retract but not the box. Then the door slammed shut and the driver went on his way. "What was that?" I heard Joe say as I looked to see the back of a woman's figure moving slowly away from the car. I could tell by the way her hands were cupped over her face that she was weeping. "Weird," said somebody else, one of my young nephews no doubt. It was several minutes before anybody addressed this strange occurrence again. The church, you see, was around the corner from where my mother had spent much of her life, and so driving along these streets, behind a vehicle carrying her casket, was a notable event for us all. We went past the apartment house where she had lived as a girl, then a wife, and finally as a mother. We drove past the candy store that was first my grandfather's and then my parents', until my father died and mom could no longer run the business by herself. It was a planned post-funeral procession which we family members had steeled ourselves for the entire morning. We were not about to allow a stranger's unwanted interruption impose upon so poignant a moment in our lives. A few minutes later, after we had cleared the last memorable site along the narrow pathway of my mother's life, Michael began to laugh. 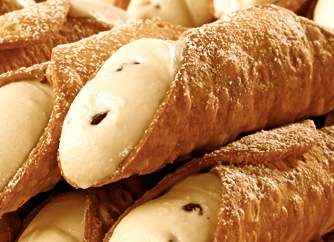 "Cannoli," I heard him say. "A whole box of them. Look." He raised the white box to show those of us behind him. It was a pastry box, I now could see. "Probably one of the ladies from the Rosary Society," Joe offered, a wise deduction as our mother, a pillar of her church for 60-plus years, would be badly missed by its constituents. "I'll be damned," was the best I myself could add to the moment. Unlike the rather grand funeral my mother's church presented her with, the graveside service was quite brief. Though sunny and clear, that February day was bitterly cold. As the priest read passages from a book he held in glove-covered hands I noticed some of my cousins huddling close by their elderly parents, trying to warm them no doubt. Everyone looked so awfully grief-stricken and sad. My mother had been blessed by a family and many friends who loved her very much. I imagined that as soon as the service had ended people would move quickly to their cars seeking warmth, but the opposite happened. We all stood there. Silent for the most part, except for the soft sounds of weeping and the occasional chattering of teeth. Nobody, it became clear, wanted to leave my mother in the cold all by herself. Then suddenly Michael went to the limousine, reached inside and took out the box of cannoli. He lifted the top, made a rough calculation as to how many pastries there might be (two and a half dozen, he later told me), then moved about offering cannoli to the people in our group. Even my mother got one, as the last cannoli was laid to rest alongside her. If you knew my mother you would appreciate how fitting a gesture this all was. Throughout her life the woman was happiest when she could feed people. Nothing came remotely close to pleasing her as this. In her final days, I am certain that her inability to cook even simple meals for the people she loved brought her far more pain than any ailment she endured. And so I will forever be grateful to the churchwoman I never knew, but also to my brother for his quick thinking that day about how best to use her gift. In an instant a box filled with 30 miniature cannoli turned painful sobbing into joyous laughter, and the mood on a cold winter's day from darkness to blistering light. Just as mom would have wanted. Some months ago, while in the clutches of an interminable Maine winter, I received a brief but, to me, astonishing correspondence from my friend Joe in the Hudson River Valley. "Seltzer is in the building," the note began and, in Joe's way, abruptly ended. My friend did not always live along the river. Like me, he is from Brooklyn, where families once routinely had seltzer delivered to their homes but no longer. Joe, I knew from prior discussions, had heard rumors of a seltzer man who still delivered nearby. Now I knew that he had found him. "No way," I texted back furiously. "Way," Joe typed. "I'm not on the guy's route so gotta do 4 cases minimum. That's 40 bottles at $3 a pop. Fine by me." Before I could answer, Joe was back. "Get this. He refills his bottles at Gomberg Seltzer Works in Canarsie, the last place in the metro area that does the job." If not for the grim climatological conditions, I would have been out of the house and off to my friend's place faster than you could say U-bet. Old-fashioned bottled seltzer, cases of it, were waiting. All that stood between me and an authentic Brooklyn Egg Cream were 320 miles and a busted timing chain on the vehicle that I (used to) rely upon for severe winter travel. It was not until a few weeks ago that I was able to answer my friend's call. Packing two plastic squeeze bottles of Fox's U-bet syrup (the original recipe, made with sugar and only available at Passover), my associate and I saddled up and rode down to Joe and Joel's for two days of good grub, fine company and of course egg creams. The truth of the matter is that I had not made an egg cream in many years, odd considering that I spent my childhood preparing them from behind the counter of my family's fountain service store in Brooklyn. If you are unfamiliar, the egg cream is a mixture of chocolate syrup, milk and seltzer water. It does not have eggs in it, no. What's with that? Your guess is as good as mine. Here's the wikipage if you're so interested, but don't expect a definitive answer, because it doesn't offer one. Another truth is that nobody else at Joe's house that weekend cared much whether I produced a good egg cream or not. This was my thing, I realized soon after arriving. If I wanted to make egg creams using Joe's newfound source of seltzer water I could knock myself out. My companions indulged me, I'll give them that much. Joel even bought whole milk in glass bottles just to make for a nice photo op (thanks, Joel) and Joe, well, it was his $3-a-bottle seltzer that I went plowing through in this two-day spritzfest of ours. Anyway, you aren't here to suffer the strange goings on inside the mind of an obsessive soda jerk. You are here to make an egg cream, so let us have at it. After you've got about three-quarters of an inch of syrup and a couple inches of ice cold milk in a tall glass, all that's left to do is add the seltzer. But be careful how you apply it. I've seen people who should know better whip out a spoon and start stirring in a rapid-circular motion as if they're making chocolate milk for a screeching 3-year-old. Bad idea. All this will do is flatten the seltzer. I'm man enough to admit that I was a little too rusty to get it right the first few times, but the technique finally came back. So did the taste. I think. My preferred specimens were uniformly sweeter than Joe's, for instance. And yet, as my friend kept reminding me while we drank egg creams and seltzer and, later, wine under his beautiful pergola overlooking the river, it has been years since this drink was a staple in our diet. "Do we even know the flavor profile of the perfect egg cream anymore?" Joe pondered after an especially trying taste session forced upon the group by, well, me. "It might have escaped us, you know." I took my time making this egg cream. The head isn't perfectly white, as it should be, but it's close, and the bottom of the glass is properly cleared of syrup. Now, if I could only get Joe's seltzer guy to add me to his route.